The adventure gets better each stop! On advice of our friends Julie and Dennis (SeaFox N55) WORKNOT headed to Garrison Bay. Just around the corner from Roche Harbor this little bay was teaming with Bald Eagles, smooth water, great sunsets and warm breezes. Our arrival was the same day as a Grand Banks rendezvous was getting organized. Well over 80 GB's, all sporting newly done varnish and looking very sharp for the biggest GB event on the west coast. Having owned 2 GB's it was great to see so many 42's and 46's in one place. I did not miss the teak work but they are outstanding looking boats and really gave birth to the recreational trawler market. 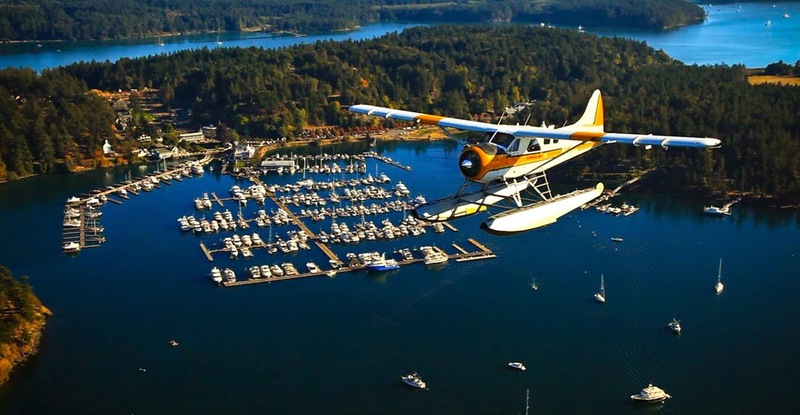 Roche Harbor has a private air port, numerous parks, private homes, condos, hotels and plenty of things to do. Commercially the port was a major limestone and cement facility dating form the late 1800's. Near the private airport is a collection of sculptures with over 75 pieces of artwork all set in acres of rolling green fields. This is just one example that caught my attention. The detail photo gives a clue on why I found it so interesting. You can stay at these small cabins all within walking distance of the main hotel and restaurants. Great name for a chapel, its still standing and operating. (Opened in 1892) Thousands have passed by this waterfront chapel on voyages as simple as ours to Bellingham (36 Miles) or half way around the world to England. Our primary mode of transportation for the next few months. On the way to Roche Harbor cut a corner and found the bottom a long way from shore. Plan to add a depth finder when we get to Bellingham. Nothing fancy but it will be nice to know when it gets skinny. Just behind our anchorage is an park where the English who occupied the island were headquartered. On the other end of the island there is American camp. San Juan Island was reluctantly shared. A brief history below and reference to the great "Pig War". In 1843, the Hudson's Bay Company established Fort Camosun at nearby Vancouver Island. The 1846 Oregon Treaty established the 49th parallel as the boundary between Canada and the U.S. west to the middle of the Strait of Georgia, and then by the main channel south to the Strait of Juan de Fuca and from there westwards to the open ocean. While both sides agreed that all of Vancouver Island would remain British, the treaty did not specify which channel the boundary should follow between the Strait of Georgia and the Strait of Juan de Fuca, resulting in a boundary dispute. This dispute, though simmering immediately in the wake of the treaty, escalated in the 1850s. In 1852 the Territory of Oregon created Island County, defined to include the San Juan Islands (or "Haro Archipelago"). In 1853 Island County became part of the newly created Washington Territory. Washington Territory's legislature created Whatcom County out of parts of Island County, including the San Juan Islands. In 1855 Washington Territory levied a property tax on properties of the Hudson's Bay Company on San Juan Island, which the HBC refused to pay. Washington Territory then advertised and sold the properties to satisfy the unpaid taxes. This led to talks between the governors of Washington Territory and the Colony of Vancouver Island. It soon became clear that the US claimed Haro Strait as the international border, while Britain claimed Rosario Strait, with both sides laying claim to the San Juan Islands. The escalating dispute led to the Pig War in 1859 and the resulting San Juan Dispute, which was a protracted diplomatic confrontation. Effectively a stalemate, with no clear legal arguments, it continued until the boundary issue was eventually placed in the hands of Emperor Wilhelm I of Germany for arbitration in 1871. The border, through Haro Strait, was finally established in 1872. English camp had a parade ground, English style gardens, barracks, ammunition storage and private homes for officers and their families. Expect being sent to duty at English Camp was more of reward than a duty. Another tough day for Keela as she does guard duty overlooking the anchorage.